Criminal Thoughts and News from your favorite Polka Hip Hop band! 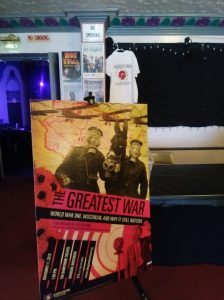 About Last Year And What Comes Next: Looking back on 2018 and ahead to 2019: Part 3: The Greatest War and the Last First Friday. NTSC on Stanford Poetry Blues and Graduation for One! Mariothepoet on Always Ready, Ever Stalwart! AKA we played the Cactus Club! Spade1 on We’re picking up the CDs tonight! How about this new wordpress format hey? Readers may not know but bloggers you know what I mean…. 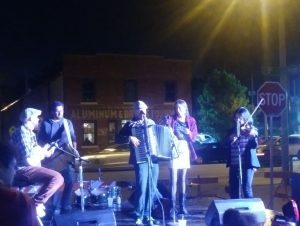 So if you read part one and two you know the Milwaukee Polka Riot was every bit as epic as anything we’d done up to that point and then we followed it up by opening for Brave Combo, who are as epic a band as any we’ve encountered. We managed to release our EP The Black Hand. We achieved more things in the 2018 than we had imagined when we first formed and started writing music. Then we took part in something that much like our participation in Dontre Day in 2017 allows us to add our unique sound to a moment of historical significance and collective remembrance. It was a moment where many of our personal beliefs about things like violence and war along with goals for what our music can add to the cultural conversation. But first we had to get there. Now I am not going to say much because I love my brother NTSC to death. Seriously, anybody rushes the stage to touch him I will stop them and ask if they are nice touches first. interesting one. Sure gas is a thing but so is comfort and I arrived grumpier than I needed to be for the Greatest Show of 2019. ARRIVAL @ The Barrymore Theater. as actually been written about this event. I know it is likely not enough. Let me tell you about an event that was very close to our hearts and very much in the vain of what we as a band are about. we saw the name of the show in the marquee. 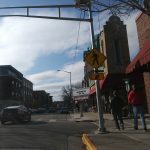 Being a keg of Milwaukeeans we don’t often get to explore every portion of Madison but we could tell this had potential. The excitement in the car however, had more to do with being able to get out and stretch our legs. Admittedly, it was short journey but it had left its mark. We found our way inside and caught our first glimpses of the big screen that would be behind us showing photos and film footage from the War to End All Wars. The poster in the lobby (I still want one!) and the soon to be merch area. Somehow we managed to keep our composure as we were informed during the practice run through that 500 tickets had already been sold. The production was halfway to selling out. Obviously we were not alone in this venture. In fact! It wasn’t even our idea… though we may have inspired it. We first met, and played a show with, John from The Periodicals back in 2017. 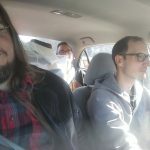 That we were a Polka Hip Hop band was already novelty enough but that our lyrics contained a histrionic awareness that stretched into metaphor and back again inspired a conversation. The Armistice 100 was coming up. This we were all aware of. My hope was to be a part of something. A show. A memorial service. Something. You can’t just name your project November Criminals without being aware of where that name comes from…unless you’re a crappy teen thriller. Though the name wouldn’t be popularized in Germany until the mid to late 1920s the origin of November Criminals starts with the end of World War One. It’s the deragotory name for the politicians and Generals that signed the Treaty of Versailles but it also became the name used for anyone that was seen to have pacifist leanings or be generally non-nationalist. The joke is (if you don’t know by now) that “Music Nazis” hate November Criminals. But if we’re doing our job right hopefully not as much as actual Nazis. Of course the end of World War One paves the way for an enormous cultural shift all over the globe. But the price paid was in blood. Marking the armistice however is difficult to do. History moves seemingly so much faster now with every day a renewed struggle against white nationalism taking place in real time on cable news. And now with the last members of the so-called Greatest Generation of Americans passing on our history seems to be muddled beyond what was captured on film in the 1940s. The program we were part of hit it out of the park. When we next met John in person we were performing at the WORT block party. He had some exciting news and new friends to introduce us to. Ken Fitzsimmons from The Kissers had an idea that he wanted to share with us. He and John along with some other friends were planning a show to commemorate the 100th anniversary of the armistice. I think we all knew that we needed to be a part of something as historically relevant as this. There was a time when I myself would have tried to organized something like this but I knew my resources were limited in Milwaukee and I had no way of knowing what the support for something like this would be. And as I would find out on the day of show my vision was not as grand as Ken’s. 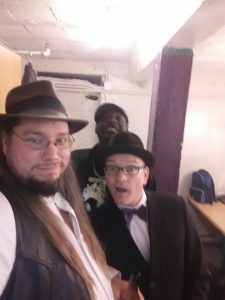 Myself, John Wedge, and Spade ONE in one of the dressing rooms at the Barrymore Theater. In addition The Periodicals and The Kissers, the program also enlisted the talents of Sean Michael Dargan, Hanah Jon Taylor, The Viper & His Famous Orchestra, and others, along with readings of poetry, journal entries, newspaper articles and speeches from the era. Still photos were on display throughout the show that helped the audience immerse themselves in the time period. 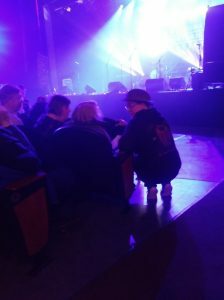 It wasn’t a stand up and rock out show (though at time it could have been) it was a history lesson and a rock opera all at once. I don’t know how many times in my life I will be a part of something as important and as relevant as this show but if it happens again you know I will still be sneaking into the audience in between our songs. 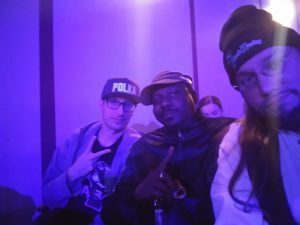 NTSC, Spade ONE, and yours Bru-ly in the audience. Kevin KC Christensen visits with his Grandmother. He’s wearing a doughboy helmet passed down from a family member that served during WW1. Available damn near everywhere online! As previously alluded to the process of writing and recording The Black Hand at time resembled that of our first album. Lots of attics and spare room hangs. And while it seems like with just three new songs released it should not have been difficult there were times where, speaking for myself, the creative faucet was not on. And so I had to look to my brothers in PolkaHopHop for inspiration and motivation. Even as we hacked away on our EP and celebrated the triumph of a successful 2nd annual Milwaukee Polka Riot we were also looking forward to upcoming shows including our first out-of-state gig with polka legends: Brave Combo! 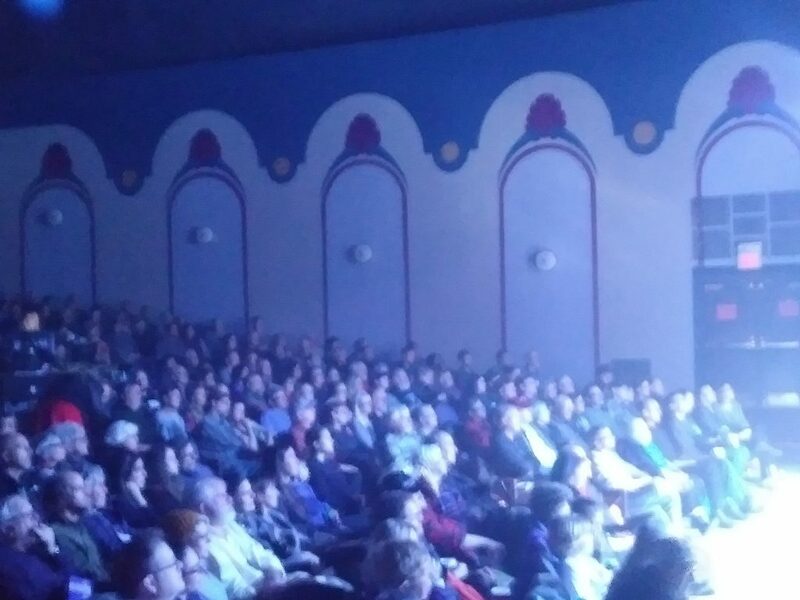 While it was not even 2 hours away and therefore not the farthest we have traveled for a show, the fact is we had yet to get a booking outside of Wisconsin. There’s a million reasons why we hadn’t been able to leave the confines of our fair state and the hope is we will be able to repeat that endeavor. The idea that we would play a show with Brave Combo was actually something on the wish list of NTSC albeit the idea was that they would join us at the Milwaukee Polka Riot eventually. As fate would have it Polkatoberfest was scheduled to take place over two nights in Lombard, Illinois with headliners Brave Combo and Bolzen Beer Band with local support from our friends Sgt. Sauerkraut’s Polka Band. Bolzen however, had another booking that Saturday and SSPB dropped our name as a replacement! Brave Combo is an absolute party! In true November Criminals fashion we rocked the set but also in true November Criminals we had audio issues! For seemingly no reason whatsoever NTSC’s digital melodeon ceased to make noise. Super producer and drummer Kevin Christensen was on hand to make a killer beat and Spade ONE and myself freestyled to end the set. Thankfully, the melodeon ended up being fine but the gremlin that silenced NTSC remains a mystery. We love playing in Racine! September just kept rolling! We’ve been lucky to have our name get around more and more we found ourselves playing a show every weekend that month! To be sure we were meeting new friends and making new fans every time we played but we were also getting closer and closer to being able to release the Black Hand! 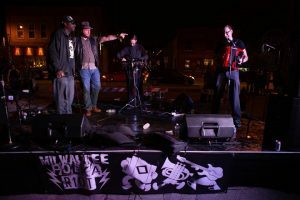 We had fun in Racine at Party on the Pavement and then we closed out September with a special duo performance of DJ Brumeister and solo melodeon by NTSC at the Riverwest Oktoberfest! I got to break out my box of 78s and discovered that those things are heavy but they are a joy to play to a new audience. NTSC makes some really killer posters does he not? To help celebrate the release of the Black Hand EP we did two things. First we released a pre-mastered version of the song The Black Hand via the CheddaREvoluion compilation and Secondly we decided to coincide the release with a booking at the Pabst Tap Room. While the Tap Room was kind to us, sadly, the audience was primarily there for the fish fry. We are learning as much as some of the venues about what works when booking a show. Note: people go to restaurants to eat. While the eatery/bar/venue thing may work occasionally I have seen it fall flat more often than not. One of the three aspects always seems to suffer. Next time we play a restaurant we will figure out a food special. Thankfully, we closed out our October shows with a rollicking gig at Bremen Cafe… a place that no longer serves food but still has a bar and a room for bands! (see what I’m sayin?) Atheists and Airplanes are awesome and you should see them! 2018 wasn’t done yet however and though we didn’t realize it at the time we were slated to take part in the biggest show of our band’s history! It was not for lack of booking that we neglected our blog! IN FACT we participated in two of our biggest shows to date AND we released a new EP! The Ups and Downs of any year are just as easily documented in the music and in the performance of any band but in addition we like to use this arena for reflection. What was difficult about The Black Hand was having to revert to some of our old school methods of recording, mixing, and mastering… i.e. somebody’s attic (in this case the incomparable John Gleisner’s ), somebody’s spare room (the indispensable Kevin Christensen), and somebody not in the band (the incredible TJ Wallace). All this for just three new songs BUT the new songs helped us to bookend with thematic resolve, both some histrionic and sonic, allegiances we created for ourselves. 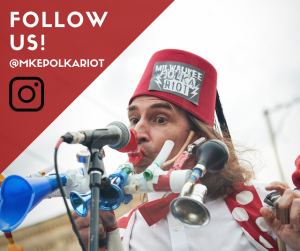 On the live side of things however, the 2nd half of 2018 really starts with the 2nd annual Milwaukee Polka Riot! Our good friend, Jim Rice, along with NTSC, Laura Schaub, Spade ONE and myself organized and/or participated in the build up to the event. Much like last year this labor of love bore fruit as were able to deliver the goods on stage along with bands from around the country! The event kicked off with Sgt. Sauerkraut’s Polka Band overcoming a glitch in the matrix early on and bringing the fun into the crowd during a brief power outage. They also demonstrated marketing savvy in customizing their attire for the festival which is something we’ll have to steal at some point! I should mention that in between sets I was doing my utmost as DJ Brumeister to keep the old fashioned polka records spinning. One of these years I’ll invest in a 2nd turntable and mic stand! 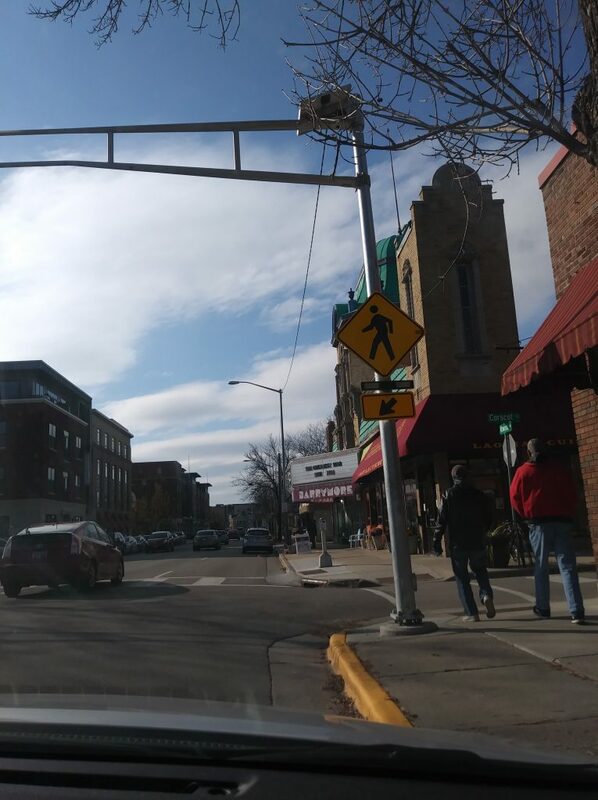 However I am still grateful to WXRW for the use of their equipment. Also, the food trucks were in effect this year as was the Tullamore Dew tent along with some very good beer from War Pigs Brewery. I know I saw NTSC go back for a 2nd and possibly 3rd soda from the good folks at Sprecher Brewery. 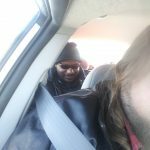 He needed it though as Preomnor was set to steal the show by throwing down heavy with their set which included a Led Zeppelin cover that would be enough to make Greta Van Fleet think twice about following them! Not to worry though because Riot veterans Forró Fo Sho came up and gave the crowd an update on their sound that was as infectious as anything heard on the street that day or at any festival that summer! Then it was our turn to close down the outdoor stage. Next year we may yield our outdoor closer status to another act, depends what sort of permits we get and how inflated our egos are, but even with an abbreviated set we were thrilled to power through our first EDM style set with Mike Ritter putting down the bass and managing the samples and making us sound way cooler than we thought possible! It proved yet again that keeping an open mind to new sounds creates new possibilities and frankly I would not be surprised to see more of this in the future. I also did my best to look like Cousin It at the start of things. Shutting down a street in Walker’s Point to present a Polka-fusion fest is not something I would have imagined doing 10 years ago. I don’t know if that was something we thought we’d do when we started this band. I don’t know if we thought we’d end up last this long either but we have. The Riot went indoors with heavy hitters out of Madison Yid Vicious , Chicago legends The Polkaholics and Kansas City road warriors Apolkalypse WOW! With acts coming from far and wide and an audience that stayed late into the night we drank in the wonder of it all along with some well earned libations. This night was a success and we had to believe we were on the way up. But 2018 was not done and neither is this post! 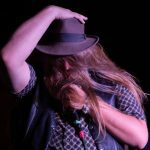 We still have to talk about the EP release, meeting Polka legends Brave Combo, The Greatest War, and the last First Friday! 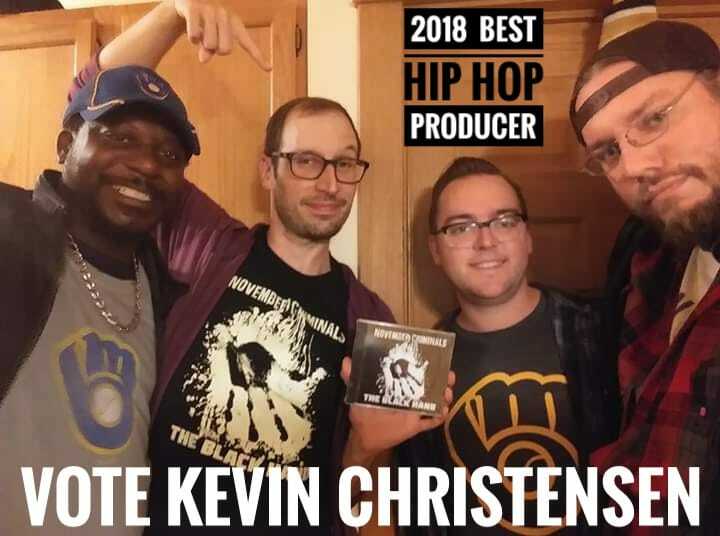 AND OF COURSE Kevin Christensen’s nomination for Best Hip Hop Producer in the Shepherd Express Best Of Milwaukee 2018 poll! Part two will be up soon! Stick around!